Home Revenues What is Revenue From Operations? What is Revenue From Operations? Revenue from operations can be defined as the income generated by an entity from its daily core business operations. If the entity is able to generate a steady flow of income from its operations, it is said to have been running successfully. It is also called operating revenue. Example – ABC Automobile Co. makes and sells automobiles as their daily core business, so their revenue from operations is said to be generated by production and selling of automobiles only. Point to be noted – let’s say in a financial year ABC Automobile Co. earns a significant amount of money by selling one of its manufacturing plant (building), this will NOT be considered as revenue from operations instead this will be termed as a capital receipt. Operating revenue or Revenue from operations is calculated by taking into account the figure of Sales after factoring for any sales return or discounts allowed. After calculating the net operating revenue deduct the amount of cost of operations to derive the operating profits of a company. The same can be explained with the help of a simple illustration. Revenue from Operations is the starting point for Profit and Loss or Income and Expenditure Account. Following are some of the incomes/expenditures which are not considered while calculating Revenue from Operations. Income from Non-operating activities like profit on the sale of an asset, Income from investments, etc. Administrative expenses like salaries, lighting and electricity, etc. Selling expenses like advertising and promotions, etc. What is Income Received in Advance? What is Capex and Opex? What are Different Accounting Concepts? What is the Difference Between Revenue and Profit? What is the Difference Between Gross Profit and Net Profit? What is the Difference Between Capital Receipts and Revenue Receipts? What is the Difference between Gross Profit and Operating Profit? What is Net Profit Ratio? What is Operating Cash Flow Ratio? What is Operating Profit Ratio? 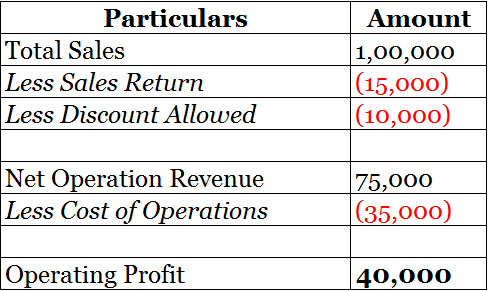 What is the Difference Between Net Profit and Operating Profit?